Follow-up of the UNECE/FAO Regional Forum on Cross-boundary Fire Management, organized by the UNECE/FAO Team of Specialists on Forest Fire through its Coordinator  the Global Fire Monitoring Center (GFMC), Germany, and supported by the Council of Europe and OSCE (28-29 November 2013). Continuation of the ENVSEC / GFMC project Enhancing National Capacity on Fire Management and Wildfire Disaster Risk Reduction in the South Caucasus (Phase III), Georgia, Azerbaijan, Armenia. Establishment of the Fire Management Resource Center-Central Asia Region, Ulaanbaatar, Mongolia. Initiation of the project Fire Management in UNESCO World Natural and Cultural Heritage Sites and other Protected Areas, supported by the Council of Europe. 9th International Conference on Dendrochronology, with GFMC contribution Climaticsensitivity of trees in high biodiversity forests in Mongolia (O. Byambasuren);Melbourne, Australia. 22nd OSCE Economic and Environmental Forum “Responding to Environmental Challenges with a View to Promoting Cooperation and Security in the OSCE Area”, with GMFC contribution to Panel III “Improving environmental security: How can we reduce natural disaster risks? Lessons learned”; donour negotiations for the Phase III of the OSCE-ENVSEC Project “Enhancing National Capacities on Fire Management and Wildfire Disaster Risk Reduction in the South Caucasus”; the proposed project “Improving cooperation on suppression of wildland fires in the Ukrainian and Belorussian parts of the Chernobyl Exclusion Zone” and “Strengthening of Fire Management Capabilities in Mongolia and Selected Central Asian Countries (Kazakhstan, Uzbekistan, Kyrgyzstan) through the Establishment of a Regional Central Asia Fire Management Resource Center” (J.G. Goldammer); OSCE Headquarters, Vienna. Seminar and Training on the Use of Prescribed Fire in Conservation, for staff of the Federal German Forest Service, Region Eastern Germany (J.G. Goldammer, E. Beltrán); Federal Forest District Lausitz, Weisskeissel / Krauschwitz, Zschornoer Heide, Germany. Visit and briefing of the Youth Fire Brigade, Malterdingen, Emmendingen County; GFMC. Consultation on the preparation of the planned OSCE/ENVSEC project “Improving cooperation on suppression of wildland fires in the Ukrainian and Belarusian parts of the Chernobyl Exclusion Zone” with Stephan Robinson, Green Cross Switzerland; GFMC. Consultation with the Executive Director of the Institute for Advanced Sustainability Studies (IASS), Klaus Töpfer, on global vegetation fire management; GFMC/IASS. Work visit of Nikos Koutsias, Environmental Informatics, Remote Sensing and GIS, Department of Environmental and Natural Resources Management, University of Patras, Greece; GFMC. Consultation of the OSCE/ENVSEC project Enhancing National Capacity in Fire Management and Wildfire Disaster Risk Reduction in the South Caucasus in preparation of the planned component “Development of an Operational South Caucasus Wildland Fire Danger Rating System” with the Expert Group “Environment & Disaster Risk Reduction”, Swiss Agency for Development and Cooperation (SDC) (Urs Bloesch, Michael Sautter), with teleconference connected to OSCE Headquarters (Vienna) and Canadian Forest Service, Great Lakes Forestry Centre, Sault Ste. Marie, Ontario); GFMC. Seminar and Training on the Use of Prescribed Fire in Conservation, for staff of the Federal German Forest Service, Region Western Germany (J.G. Goldammer, O. Byambasuren); Federal Forest District Rhein-Weser, Drover Heide, Germany. Instructions to the future prescribed burning teams, fire, cattle and the group. Seminar and Training on the Use of Prescribed Fire in Conservation, for staff of the Federal German Forest Service, Region Southern Germany (J.G. Goldammer); Federal Forest District Hohenfels, Schmidmühlen, JMRC Training Range, Germany. Impressions of the training of use of high-severity prescribed fire for controlling the spread of black thorn (Prunus spinosa). Preparatory mission for the establishment of the Regional Central Asia Fire Management Resource Center (RCAFMRC) (O. Byambasuren); Ulaanbaatar, Mongolia. National Seminar on Strengthening Fire Management in Mongolia-2014, organized by the National Coordination Committee on Forest and Steppe Fire Protection (NCCFSFP) (Secretariat: O. Byambasuren, GFMC / RCAFMRC); Ulaanbaatar, Mongolia. Fifth National Round Table on Fire Management in preparation of the National Fire Management Policy for Georgia and the implementation plan, conducted in the frame of the ENVSEC / GFMC project Enhancing National Capacity on Fire Management and Wildfire Disaster Risk Reduction in the South Caucasus (J.G. Goldammer); Tbilisi, Georgia. Consultation with FAO on international cooperation in fire management (J.G. Goldammer); FAO Headquarters, Rome, Italy. ENVSEC Regional Meeting for South Eastern Europe (J.G. Goldammer); Podgorica, Montenegro. Roundtable discussion with regional cooperation initiatives, programmes and partners. Fourth meeting of the International Working Group on Cooperation in Wildfire Preparedness and Response (IWG-CWPR) for the development of a proposal for international voluntary standards for harmonization, standardization and promotion of best-practice and for safe and efficient sharing of wildfire emergency response resources between countries for wildfire emergency analysis & assessment, wildfire emergency advisory support to nations in distress and wildfire emergency response (in following up the UNECE/FAO Forum on Cross-boundary Fire Management, United Nations, Geneva, 28-29 November 2013); GFMC, Freiburg, Germany. Eastern European consultation on the follow-up of the UNECE/FAO Regional Forum on Cross-boundary Fire Management (UN Geneva, 28-29 November 2013) and first Eastern European Prescribed Fire Demonstration and Long-term Observation Experiment on the use of prescribed fire in wildfire hazard reduction in pine stands (J.G. Goldammer); Regional Eastern European Fire Monitoring Center (REEFMC), National University of Life and Environmental Sciences of Ukraine (NULESU), Kyiv and Boyarka Forest Research Station, Ukraine. Follow-up of the prescribed fire demonstration at the Ukrainian Center of Training and Advanced Education of Forestry Professionals Ukrcentrkadrylis, Boyarka city. Third Workshop of the Interdisciplinary Biomass Burning Initiative (IBBI) (J.G. Goldammer); Schloss Ringberg, Max Planck Society for the Advancement of Sciences, Germany. International Conference Reducing Forest and Agricultural Fires as a Driver of Climate Change by Systematic Use of Biomass as a Source of Renewable Energy and for Reducing Wildfires and Unnecessary Agricultural Burning, with GFMC contribution International and Regional Policy Initiatives to Address the Consequences of Wildfires, Excessive and Wasteful Burning of Agricultural Residues on Environment and Human Health, including Cross-Boundary Transport of Atmospheric Pollutants (J.G. Goldammer); Bihac, Bosnia and Herzegovina. Consultations of the field project Erprobung und Entwicklung von Methoden zur Heidepflege durch kontrolliertes Feuer auf munitionsbelasteten Flächen im NSG Heidehof-Golmberg (Landkreis Teltow-Flaeming) (2009-2014) (Prescribed burning on former military terrain contaminated by unexploded ordnance [UXO], Teltow-Flaeming County, Germany) (J.G. Goldammer); Luckenwalde, Germany. Third National Dendroecological Fieldweek (O. Byambasuren); Forest Research and Training Center, National University of Mongolia, Tuv province, Mongolia. Preparatory mission of field study Fire Management in UNESCO World Natural and Cultural Heritage Sites and other Protected Areas supported by the Council of Europe, Secretariat of the European and Mediterranean Major Hazards Agreement (EUR-OPA): Employing very high resolution EO images and fine fuel sampling methods, aimed at characterizing fuel properties in Mount Athos UNESCO World Heritage Site (I. Mitsopoulos, E. Beltrán); Autonomous Monastic State of the Holy Mountain, Greece. Fire hazard and fuel assessment in Autonomous Monastic State of the Holy Mountain, Greece. Work visit and exchange with of Lestech, s.r.o., Zásmuky, Česká Republika; GFMC. Fire history and climate research field expedition (O. Byambasuren). Uvurkhangai, Arkhangai province, Mongolia. Consultation on Transboundary fire management in preparation of Mongolian-Russian Government Agreement on Transboundary fire management cooperation (O. Byambasuren). National Committee on Forest and Steppe Fire Protection and Ministry of Environment and Green Development, Ulaanbaatar, Mongolia. 36th session of the FAO/UNECE Working Party on Forest Statistics, Economics and Management, with the final report of the UNECE/FAO Team of Specialists on Forest Fire (J.G. Goldammer); United Nations, Geneva, Switzerland. Meeting with Green Cross International (GCI) in following up the UNECE/FAO Regional Forum on Cross-boundary Fire Management (UN Geneva, November 2013) (J.G. Goldammer); Geneva, Switzerland. Meeting with the UN Office for Disaster Risk Reduction, UNISDR Secretariat, in followoing up the UNECE/FAO Regional Forum on Cross-boundary Fire Management (UN Geneva, November 2013) (J.G. Goldammer); Geneva, Switzerland. Container loading of the library, field and laboratory equipment (GFMC donation) for the Fire Management Resource Center-Central Asia Region (FMRC-CAR), Ulaanbaatar, Mongolia. International Workshop “Fire Management in Protected Areas and Cultural and Natural Heritage Sites”. Meeting of members, partners and observers of the Council of Europe / EUR-OPA Project Fire Management in UNESCO World Natural and Cultural Heritage Sites and other Protected Areas, in preparation of the IUCN World Parks Congress 2014; GFMC, Freiburg, Germany. 2014 Meeting of the International Fire Aviation Working Group (IFAWG) in finalization of the International Fire Aviation Guidelines and the International Manual of Common Rules for Fire Aviation; GFMC, Freiburg, Germany. 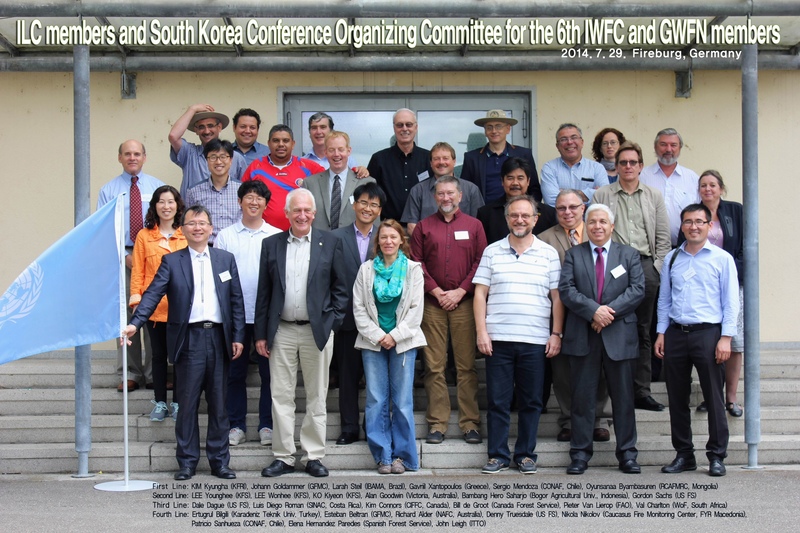 Joint Meetings of the UNISDR Wildland Fire Advisory Group (WFAG), International Liaison Committee (ILC) and South Korea Conference Organizing Committee (SKCOC) for the 6th International Wildland Fire Conference, and the International Fire Aviation Working Group (IFAWG), In cooperation with and supported by the UN Economic Commission for Europe (UNECE), Forestry and Timber Section, Euro-Mediterranean Major Hazards Agreement (EUR-OPA), Council of Europe, Organization for Security and Cooperation in Europe (OSCE), United Nations University (UNU), International Tropical Timber Organization (ITTO), U.S. Forest Service, Korea Forest Service (KFS) and Korea Forest Research Institute (KFRI); GFMC, Freiburg, Germany. Business meeting of the coordinators of the Regional Wildland Fire Networks of the Global Wildland Fire Network; Freiburg, Germany. Preparatory mission for the 22nd OSCE Economic and Environmental Forum “Responding to Environmental Challenges with a View to Promoting Cooperation and Security in the OSCE Area” (J.G. Goldammer); OSCE Headquarters, Vienna. Sixth National Round Table on Fire Management in preparation of the National Fire Management Policy for Georgia and the implementation plan, conducted in the frame of the ENVSEC / GFMC project Enhancing National Capacity on Fire Management and Wildfire Disaster Risk Reduction in the South Caucasus in Cooperation with the Ministry for Environment and Natural Resources Protection and Deutsche Gesellschaft für Internationale Zusammenarbeit (GIZ) (J.G. Goldammer); Tbilisi, Georgia. From left to right: (1) The Round Table was addressed by Ms. Khatuna Gogadlaze, Minister of Environment (right) and the Mr. Bidzina Giorgobiani, Head of the National Forestry Agency; (2) Johann G. Goldammer, Director, GFMC; and (3) Ms. Catherine Nakashidze, OSCE. GFMC-GIZ Georgia Mission Integrated Fire Management I in the frame of the GIZ Programme “Sustainable Management of Biodiversity, South Caucasus” and in cooperation with the ENVSEC / GFMC project Enhancing National Capacity on Fire Management and Wildfire Disaster Risk Reduction in the South Caucasus (J.G. Goldammer); Dedoplistskaro municipality and Tbilisi, Georgia. From left to right: (1) Burning of agricultural residues starts after terminating wheat harvest in July; (2) Windbreak belts largely destroyed by fuelwood cutting in the 1990s are further degraded by fires spreading from agricultural burnings; (3) close look at the fire and cutting effects in the windbreak belts; and (4) protection of rehabilitated windbreaks by a ploughed firebreak. Degraded pasture ranges in Dedoplistskaro Municipality, Georgia. The empty signpost symbolizing the deterioration of an old natural and cultural landscape by overgrazing, wind erosion, increasing droughts and fires. GIZ/GFMC consulting with the local shepherd. Forest fire exercise Breisgau-Hochschwarzwald County (E. Beltrán, O. Byambasuren, J.G. Goldammer, A. Held, F. Mayer); Hinterzarten / Rinken / Zastler, Baden-Wuerttemberg State, Germany. GFMC-GIZ Georgia Mission Integrated Fire Management II in the frame of the GIZ Programme “Sustainable Management of Biodiversity, South Caucasus” and in cooperation with the ENVSEC / GFMC project Enhancing National Capacity on Fire Management and Wildfire Disaster Risk Reduction in the South Caucasus (J.G. Goldammer); Dedoplistskaro municipality and Tbilisi, Georgia. Global Observation of Forest and Land Cover Dynamics, Fire Mapping and Monitoring Implementation Team Meeting, with GFMC presentation “International Cooperation and Coordination in Wildland Fire Management” (J.G. Goldammer, presented by Bill de Groot); NOAA Center for Weather and Climate Prediction (NCWCP), College Park, Maryland, U.S.A. Concluding meeting of the 22nd OSCE Economic and Environmental Forum “Responding to Environmental Challenges with a View to Promoting Cooperation and Security in the OSCE Area”, with GMFC contributions to Session IV “A co-operative response to environmental challenges: OSCE experience and lessons learnt for the future” (with GFMC presentation “OSCE experiences in enhancing national capacities in fire management and wildfire disaster risk reduction”); and to the panel debate Session VII “The Role of the OSCE in responding to environmental challenges”; Prague, Czech Republic, 10-12 September 2014. Regional Fire Management Training for the South Caucasus, Western Balkans and Eastern Europe / Central Asia in the frame of the OSCE/ENVSEC project Enhancing National Capacity on Fire Management and Wildfire Disaster Risk Reduction in the South Caucasus; 21 to 24 September 2014, Fire Management Training Center, Antalya, Turkey. Annual meeting of the German-Russian Working Group “Sustainable Forest Management; 28 September – 01 October 2014, Krasnoyarsk, Russian Federation. Prescribed burning operation on Calluna vulgaris heathlands on Sylt Island, in cooperation with Sylt Nature Conservancy (Naturschutzgemeinschaft Sylt) and County Conservation Administration (Untere Naturschutzbehörde Kreis Nordfriesland) (J.G. Goldammer); Sylt Island, Germany. 5th International Disaster and Risk Conference IDRC (J.G. Goldammer); Davos, Switzerland. Presentation of the GFMC Publication “Vegetation Fires and Global Change: Challenges for Concerted International Action: A White Paper directed to the United Nations and International Organizations” (Session TUE7.4: Book Presentations on Integrative Risk Management, Tuesday, 26 August 2014, 17:00-18:00, room “Sertig”). Final meeting of the field project Erprobung und Entwicklung von Methoden zur Heidepflege durch kontrolliertes Feuer auf munitionsbelasteten Flächen im NSG Heidehof-Golmberg (Landkreis Teltow-Flaeming) (2009-2014) (Prescribed burning on former military terrain contaminated by unexploded ordnance [UXO], Teltow-Flaeming County, Germany) (J.G. Goldammer); Luckenwalde, Germany. First Round Table on Integrated Fire Management at State level in Germany – Brandenburg State (“Symposium Integriertes Feuer-Management in Brandenburg: Entwicklung von Konzepten für den Umgang mit Feuer und Vorbeugung von Feuerkatastrophen in den Natur- und Kulturlandschaften in Brandenburg. Eine gemeinsame Veranstaltung der Arbeitsgruppe Feuerökologie / Global Fire Monitoring Center [GFMC] und des Landkreis Teltow-Fläming. Landkreis Teltow-Fläming”) (J.G. Goldammer); Luckenwalde, Germany. From left to right: Opening of the Round Table by the Commissioner of Teltow-Flaeming County, Ms. Kornelia Wehlan, with GFMC Director J.G. Goldammer and the head of the Nature Conservation Department of the county, Dr. Manfred Fechner (also central picture, delivering his the introductory speech); and field demonstration of the fire extinguishing tank SPOT-55 of project partner DiBuKa in action. Photos: Heike Lehmann, Teltow-Flaeming County. Regional Consultation Meeting: Initiative “Environment and Security”: Perspectives of Environmental Cooperation in Eastern Europe, with participation oft he Regional Eastern European Fire Monitoring Center (REEFMC), with inputs on fire management needs in contaminated forests; Minsk, Belarus. Concluding meeting of the 22nd OSCE Economic and Environmental Forum “Responding to Environmental Challenges with a View to Promoting Cooperation and Security in the OSCE Area”, with GMFC contributions to Session IV “A co-operative response to environmental challenges: OSCE experience and lessons learnt for the future” (with GFMC presentation “OSCE experiences in enhancing national capacities in fire management and wildfire disaster risk reduction”); and to the panel debate Session VII “The Role of the OSCE in responding to environmental challenges” (J.G. Goldammer);Prague, Czech Republic. Implementation of field study Fire Management in UNESCO World Natural and Cultural Heritage Sites and other Protected Areas supported by the Council of Europe, Secretariat of the European and Mediterranean Major Hazards Agreement (EUR-OPA): Employing very high resolution EO images and fine fuel sampling methods, aimed at characterizing fuel properties in Mount Athos UNESCO World Heritage Site; and transboundary fire management on protected areas bordering Greece, Albania and FYR Macedonia (I. Mitsopoulos, E. Beltrán); Aristotle University of Thessaloniki, Greece, and Ohrid, FYR Macedonia. ASEAN-Republic of Korea Forest Cooperation (AFoCo) International Thematic Workshop on Forest Disaster Management in Southeast Asia: Challenges and Way Forward in Forest Fire Management and Training Course Training of Trainers on Forest Fire Management organized by Korea Forest Service (KFS), Korea Forest Research Institute (KFRI) and GFMC, in the frame of activities of the UNISDR Pan-Asia Wildland Fire Network (J.G. Goldammer); Seoul, Republic of Korea. Regional Fire Management Training for the South Caucasus, Western Balkans and Eastern Europe / Central Asia in the frame of the OSCE/ENVSEC project Enhancing National Capacity on Fire Management and Wildfire Disaster Risk Reduction in the South Caucasus (J.G. Goldammer); Fire Management Training Center, Antalya, Turkey. 7th International Forum Forest and Man, with contribution by GFMC “Investments in Forest Fire Protection for Safeguarding Sustainable Forest Management (J.G. Goldammer); Expocentre, Moscow, Krasnopresnenskaya Naberezhnaya, Russian Federation. The GFMC reported about the collaborative work between the Federal Forest Agency of (FFA) Russia and GFMC in Integrated Fire Management (experiences in Krasnoyarsk Region). The session was moderated by the head of FFA, Mr. Ivan Valentik. Photo: Courtesy Avialesookhrana. Annual meeting of the German-Russian Working Group “Sustainable Forest Management (J.G. Goldammer); Moscow, Russian Federation. Fire management training course at Avialesookhrana (J.G. Goldammer); Pushkino, Moscow Region, Russian Federation. GFMC-GIZ Georgia Mission Integrated Fire Management III in the frame of the GIZ Programme “Sustainable Management of Biodiversity, South Caucasus” and in cooperation with the ENVSEC / GFMC project Enhancing National Capacity on Fire Management and Wildfire Disaster Risk Reduction in the South Caucasus (J.G. Goldammer); Dedoplistskaro municipality and Tbilisi, Georgia. Annual course “Fire ecology of Tropical, Subtropical and Temperate-boreal Forest Ecosystems”, Faculty of Environment and Natural Resources, Institute of Forest Science, Freiburg University, Freiburg University (Germany), given by GFMC staff (J.G. Goldammer, E. Beltrán); GFMC / Freiburg University, Germany. 72nd session of the UNECE Committee on Forest and the Forest Industry, with final presentation of the UNECE /FAO Team of Specialists on Forest Fire and the progress report on the implementation of the project “UNECE/FAO Regional Forum on Cross-boundary Fire Management” (November, 2013) and presentation of the International Wildfire Preparedness Mechanism (IWPM) (J.G. Goldammer); Kazan, Republic of Tatarstan, Russian Federation. Environment and Security (ENVSEC) Initiative Partners Meeting, with OSCE/ENVSEC/GFMC project report Enhancing National Capacity on Fire Management and Wildfire Disaster Risk Reduction in the South Caucasus (J.G. Goldammer); Belgrade, Serbia. Presentation Enhancing National Capacity on Fire Management and Wildfire Disaster Risk Reduction in the South Caucasus. Moderator:Jan Dusik, Director and Regional Representative, Regional Office for Europe, UNEP. Presenters: Esra Buttanri, Senior Environmental Affairs Adviser, OSCE and ENVSEC Regional Desk Officer for Southern Caucasus, and Johann Georg Goldammer, Director, Global Fire Monitoring Center. Swedish Research Council Formas Review Panel Meeting addressing the call The Forest fire in the Swedish province of Västmanland (J.G. Goldammer, remote contribution); Stockholm, Sweden. Annual meeting of the Directors of the European and Mediterranean Centres of the EUR-OPA Major Hazards Agreement Meeting (EUR-OPA) (Open Partial Agreement on the Prevention of, Protection Against, and Organization of Relief in Major Natural and Technological Disasters), Council of Europe (J.G. Goldammer); Council of Europe, Strasbourg, France. GFMC greetings for 2015: Happy New Year to all colleagues, cooperators and especially the members of the Global Wildland Fire Network, with some visual highlights of the outreach and policy work of GFMC in 2014 (PDF 1.0MB).